Sou | 8:56 AM Feel free to comment! The World Meteorological Organisation has released its latest annual climate statement: The Status of the Global Climate in 2012. Click here for the press release. The report itself can be downloaded here. the ninth warmest year since records began in 1850.
the twenty-seventh consecutive year that the global land and ocean temperatures were above the 1961–1990 average. only 0.1°C less than the record high value observed in 2010. 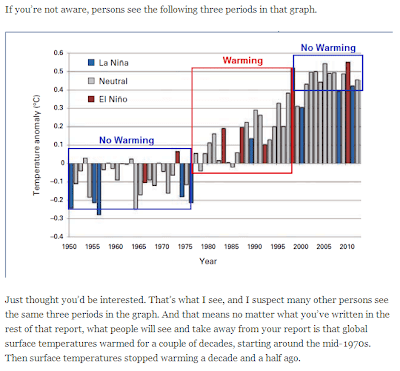 ...that means no matter what you’ve written in the rest of that report, what people will see and take away from your report is that global surface temperatures warmed for a couple of decades, starting around the mid-1970s. Then surface temperatures stopped warming a decade and a half ago. Not everyone sees the same thing. Many people will be saying "Sheesh! It's getting bloody hot on earth, we'd better do something before it's too late!" Not Bob. Here's a rough animation of the way the world has warmed, with how Bob sees it. I don't know if Bob really thinks the world has stopped warming and that CO2 has magically lost its properties or that there is no longer a greenhouse effect. That would be pretty weird. Maybe he's just wanting to share with the world that he sees everything in bits but is not able to connect the bits together to see the whole at once. May 3, 2013 at 4:07 pm I see “No Warming” then “Warming” then “No Warming But Still Freakin Hot” and I’m no warmist. May 3, 2013 at 1:44 pm I don’t see it the way you assume everyone will. I can see steady warming from 1965 to 2005 and only outside that something that can be called “no warming”. But that’s no science. There’s enough noise in the graph to allow a whole lot of different interpretations. May 3, 2013 at 2:21 pm Kasuha: At May 3, 2013 at 1:44 pm you say I don’t see it the way you assume everyone will. I can see steady warming from 1965 to 2005 and only outside that something that can be called “no warming”. OK. I understand that and what it indicates. If you cannot afford the new spectacles you require then there are some good charities willing to help. May 3, 2013 at 6:12 pm Bob, for my own tastes in casually looking at graphs, 1998 is an obvious outlier, regardless of what color the bar is. So I ignore that year as I am visually interpreting the series of vertical bars shown on the graph. This gives me a visual interpretation of continuous warming between 1965 and 2005 — for whatever that is worth to anyone, alarmist or skeptic alike. May 3, 2013 at 5:13 pm I see warming to 2002, then level to 2009, then dropping. May 3, 2013 at 3:16 pm Even on GISS figures, 2012 temperatures (which were affected by a mid year mild El Nino) show absolutely no increase on the 1997-2011 average, The simple fact is that warming stopped 16 years ago, regardless of ENSO. I'd be curious to know if readers here believe their own eyes or the eyes of someone else or whether they take another approach such as calculating trends rather than eyeballing. Or perhaps consider surface changes in the context of system wide changes, including land, air and oceans. 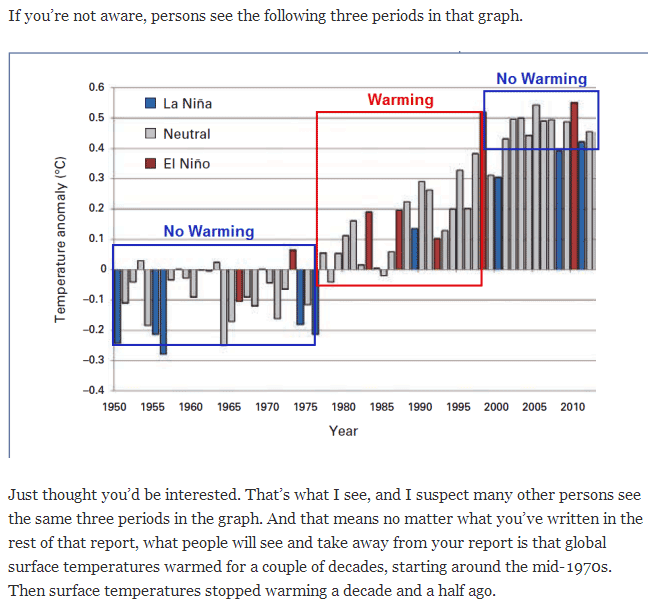 I've put the different views of the WMO chart into an animated gif - click here for the article.